Republicans have become far more upbeat about the country and its future since before Donald Trump’s election victory. By contrast, Democrats have become much less positive. As a result, opinions among the public overall have shown little change – and remain about as negative they were in Barack Obama’s final year in office. This is the case on several different opinions: about whether life in the U.S. has gotten better or worse for “people like you” over the past 50 years; prospects for the next generation of Americans; and views of current national conditions. 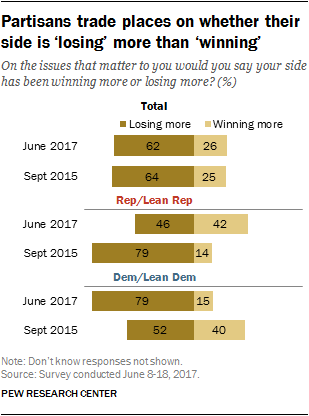 In addition, just 26% of the public say that, on the issues that matter to them, their side has been winning more often than it is losing; 62% say their side loses more often than it wins. This, too, is virtually unchanged from two years ago. The national survey, conducted June 27-July 9 among 2,505 adults, finds that Republicans are much more positive than they were a year ago when comparing life today to the distant past. Currently, 44% of Republicans and Republican-leaning independents say that for people like them, life today is better than it was 50 years ago; last August just 18% said this. The share of Republicans who see life today as worse than it was a half-century ago has fallen from 68% to 40%. Small numbers continue to say life for people like them is about the same (10% then, 13% today). Democrats have moved in the opposite direction, though the change has been somewhat less pronounced. 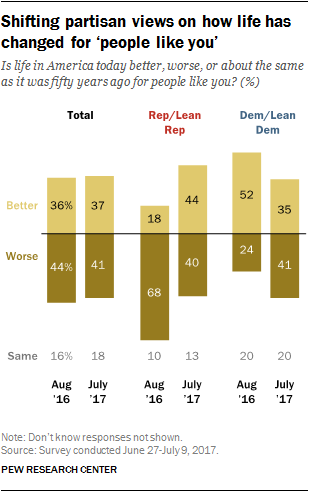 About a third of Democrats and Democratic leaners (35%) say life now is better for people like them than it was 50 years ago, down from 52% a year ago. The partisan gap on this measure, which was substantial last year, is much more modest today. Republicans are now 9 percentage points more likely than Democrats to view life as better for people like them (44% vs. 35%). Last year, 52% of Democrats said life was better for people like them, compared with just 18% of Republicans. Partisans also continue to have contrasting expectations for the next generation. Again, overall opinions have changed little since last year. And more people say the future for the next generation of Americans will be worse today (48%) than did so in either 2009 (32%) or 2008 (34%), during the economic recession. Among members of both parties, more say prospects for the next generation will be worse than better. Among Republicans, 46% say the future for the next generation will be worse, while 30% say it will be better and 21% about the same. Still, this represents a sharp improvement in opinion among Republicans since last year, when 61% said the future would be worse and just 16% better (18% said about the same). Democrats, who were divided on the next generation’s prospects a year ago, have become more negative: 50% say the next generation’s future will be worse (up from 35% last year), while 27% say it will better (down from 35%). There was a similar partisan shift in expectations for the future of the next generation after the 2008 election. In April 2008, just a third of Republicans (34%) said they expected the future to be worse, but 56% said this in March 2009, after Barack Obama’s victory. Among Democrats, on the other hand, expectations for the future improved: 50% said they expected the nation’s future to be better in March 2009, up from 39% who said this before the November election. Still, Republicans are not nearly as optimistic about the future for the next generation today as Democrats were in early 2009 (30% “better” among Republicans now vs. 50% among Democrats in March 2009). A 67% majority of the public says they are dissatisfied with how things are going in this country today, compared with 28% who say they are satisfied. This represents little change over the past year. In fact, the share of Americans expressing satisfaction with national conditions has been no more than about 30% for well more than a decade. In late October, just prior to the election, only 11% of Republicans and Republican leaners said they were satisfied with how things were going, while 52% of Democrats and Democratic leaners said they were satisfied. 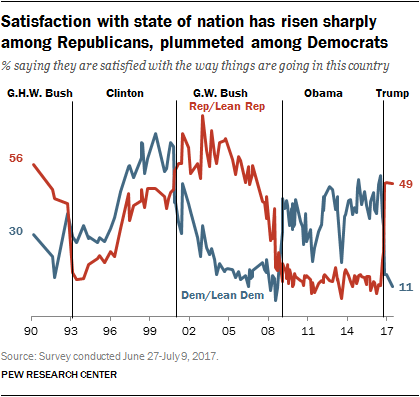 Today, these views are nearly the reverse: 49% of Republicans now say they are satisfied, while just 11% of Democrats agree. There have been only modest changes in satisfaction with national conditions among members of either party since April or February of this year. As has been noted previously, it is typical for partisans’ views of national satisfaction to shift following a change in party control of the White House, but the size of the shift among both Republicans and Democrats is more pronounced than it was in either 2001, shortly after the election of George W. Bush and 2009, following Obama’s election. Compared with 2015, Republicans are far more likely to say that on the issues that matter to them, their side has been winning more than it has been losing. Still, while Republicans now control the White House and both houses of Congress, just 42% say their side has been winning more often than it has been losing, while 46% say the opposite, according to separate survey conducted June 8-18 among 2,504 adults. Two years ago, fully 79% said their side was losing more often, compared with 14% who said it was winning more. Democrats’ views are now almost identical to those of Republicans in 2015. By 79% to 15%, Democrats say their side has been losing more often than it has been winning. Two years ago, 52% of Democrats said their wide had been losing more often, while 40% said it had been winning more often. These shifts are particularly pronounced among ideological partisans. In 2015, liberal Democrats and Democratic leaners were divided in their assessments of whether their side was losing more (44%) or winning more (46%). Today, fully 81% of liberal Democrats say they are losing more, while just 12% say they are winning. 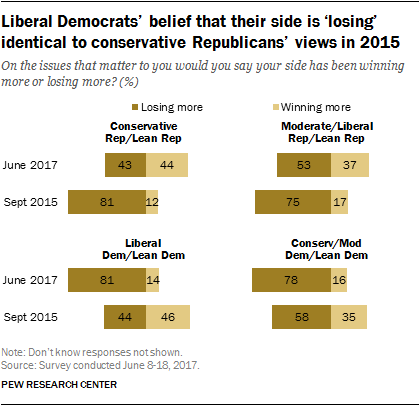 The change has been the inverse among conservative Republicans: Today, 44% of conservative Republicans say they are winning more than they’re losing, up from just 12% who said this in 2015.